We took the King Harry Ferry with the car from Feock to the Roseland Peninsula. Although a little pricey it cuts 27 miles off your journey and provides a serene way of arriving - almost like stepping into Narnia. We then followed the country lane to our destination of St Just in Roseland Church. I thought it must be good as it has been described to me as “the most beautiful churchyard in England”. And that was fairly accurate! What we found was an old church and churchyard, set in beautiful gardens, beside a tidal creek. It surpassed our expectations in location, size and interest. It is obvious that there a lot of people who care a great deal about the place and try to make it inviting to all. There’s even a children’s area inside the church where they can colour in and complete a quiz to find church kneelers. We visited in April and some of the winding footpaths were out of bounds as they had succumbed to the recent wet weather. The gardens need a lot of maintenance and a full time gardener has his work cut out. I knew that the gardens were beautiful but hadn’t realised that it was a sub-tropical oasis, almost on the scale of a mini Trebah, combined with a plethora of Cornish wildflowers and gunnera. Pretty much anyone will enjoy a visit to St Just in Roseland Church. An outside tap with bowls is situated in the churchyard for dogs. The hand sewn brightly coloured kneelers will entice the children. 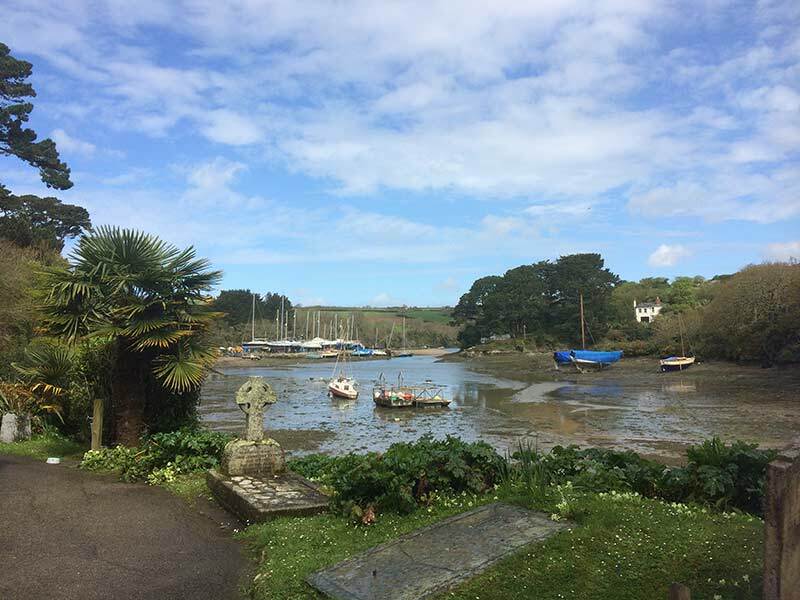 There are numerous benches set throughout the grounds with views over to the boatyard on the creek or back towards the church. 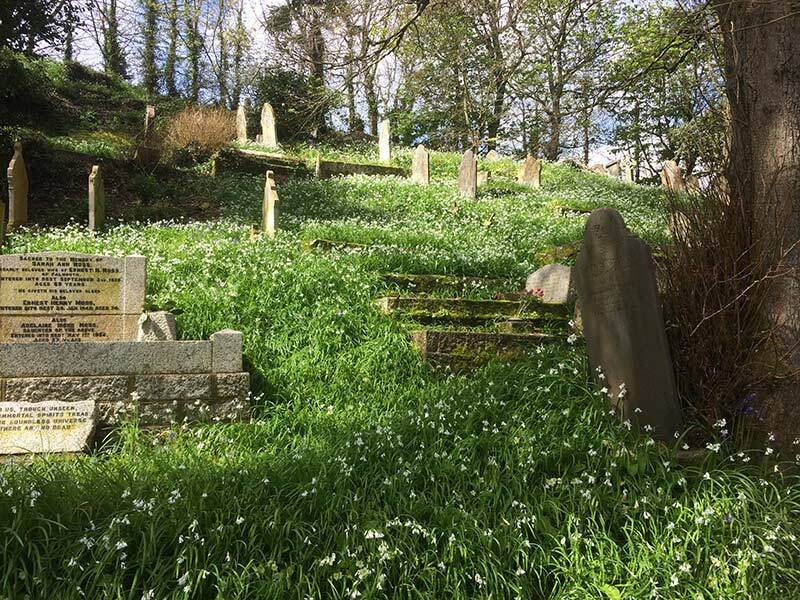 Purely by chance, our visit in the springtime was perfect to coincide with the blanket of snowdrops, bluebells and primroses. If in the area, I might return in the autumn to see the flora and fauna in fall. 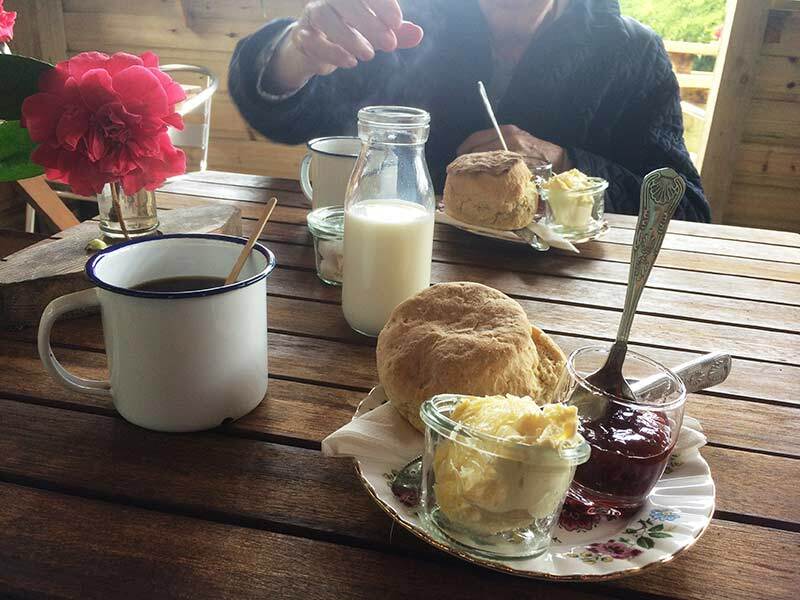 A visit would not be complete without partaking in some refreshment at ‘Miss V’s Cornish Cream Tea’. It is basically a posh shed next to the church car park but a lovely lady will serve you a delicious cream tea in a tranquil setting (I did have to share my crumbs with the resident robin). There is ample on site parking with an overflow (this is free with a request for donations). There are various walking paths down to the church itself, some steeper than others. As with most outdoor venues in Cornwall, sensible footwear is a must and you might want to bring your binoculars. To soak it all in, allow a stay of about 2 hours and don’t panic, there are surprisingly clean and tidy toilets just 200m away. Do choose a semi decent day if you can; it really isn’t worth it if it’s a rainy day as there’s no means of shelter. 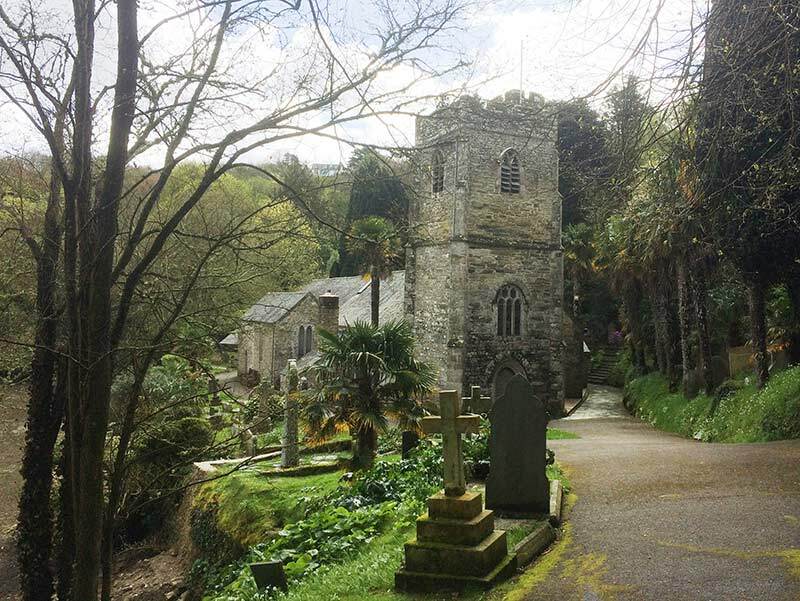 About the author: Ali is a property managed and visited the St Just in Roseland Church in April 2018. For her next visit, Ali is going to St Ives.